Andy Robertson has penned a new five-year deal at Liverpool and supporters have been left delighted with the news. Robertson’s new-and-improved contract was announced on Thursday evening, keeping him at Anfield until 2024. One of the most popular Reds players both on and off the pitch, the 24-year-old has been a revelation since joining from Hull City in the summer of 2017. The left-back is performing at a superb level currently, with very few better in his position in Europe, both in a defensive and attacking sense. Liverpool are sorting new deals at such a refreshing rate, highlighting the slick manner in which the club is operating right now. 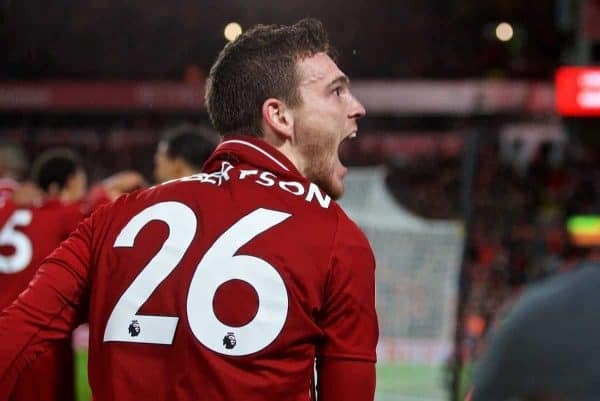 Reds fans took to social media to provide their thoughts on Robertson’s deal – here’s a round up of the best reaction. Andy Robertson new 5 year deal – get in! Few players who deserved it more. Feels good to tie him down long-term on satisfying terms for him. From a LB at Hull to one of the top LB’s in the world, what a journey he’s had in just 1,5 years. There was never a danger of losing Robertson, but it’s great news that he’s staying. Yes! @andrewrobertso5!!! Made my day you signing a new contract. Cheers ? “Excellent stuff. We have become so so good at handling player contracts and transfers now.” – Eleven in the TIA comments section. “F***ing awesome. Absolutely deserved. YNWA” – Milo_Red4ever in the TIA comments section. No surprise that Andy Robertson is being rewarded for his consistent brilliance and vital contribution to #LFC’s stingy defence with a new five-year contract. Superb for the player, who has been a revelation off the field as well, and for the club. What was once a hugely problematic position for Liverpool now one of real strength for the foreseeable future. Thoroughly deserved reward for Andy Robertson whose form has been outstanding. “Looking like the best left back to wear the red shirt and we’ve had a few good ones over the years” – Billy Lawton on Facebook. All that’s left to see now is: Just how good can Robbo get?! Andy Robertson: "As soon as the club came to me, it was a no-brainer – I want to stay here, so as soon as they put an offer on the table it was signed as quickly as that!" Massive boost. Go win us the title now Robbo lad! “Best left back in the world” – Philip Hyland on Facebook.